STS-115 Brings More Power to the Station - Universe Galaxies And Stars Section. STS-115 Brings More Power to the Station. 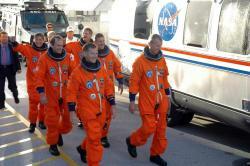 The crew of STS-115. Image credit: NASA. STS-115 is an ambitious mission that returns the focus of human spaceflight to building the International Space Station, bringing new capabilities to the ISS. While a song by John Lennon asserts that revolution will bring power to the people, it will be a new set of solar arrays and its ability for rotation that will provide more power to the space station. STS-115, the upcoming shuttle mission scheduled to launch on August 27 marks a shift in shuttle operations from Return-to-Flight to a return to the construction of the International Space Station. The last construction mission for the ISS flew in November of 2002 on the flight previous to the Columbia accident, and clearly NASA looks forward to moving on and getting back to station assembly. However, STS-115 not only has a full plate of construction duties, but must also perform the all the CAIB (Columbia Accident Investigation Board)-induced safety procedures that were tested on the past two shuttle flights, including inspecting the heat resistant tiles with the shuttle’s robotic arm and performing a pirouette with the shuttle as it approaches the station, making the underbelly visible to cameras onboard the ISS. "Flight day two, we have a very, very full day with the inspection," said Astronaut Brent Jett, commander of the mission. "So we go from launch day, right in to flight day two inspections, right in to flight day three docking, then the first spacewalk, the second spacewalk, solar array deploy and then another spacewalk. The timeline is a big challenge." The primary payload for STS-115 is the combined P3/P4 Truss sections that include a set of power-generating solar arrays, the second of four planned sets of solar wings for the station. The new arrays will add over 8,000 square feet of surface area to the ISS and combined with the two girder-like truss sections adds 17 tons to the mass of the station. But more importantly the arrays will more than double the available electrical power, bringing at least 78 additional kilowatts to the station. That’s enough to supply the electrical needs of almost 40 average homes on Earth, (based on 2 kilowatts of power each.) Subsequent construction missions will add new power-hungry science modules to the station and at long last, scientists and Astronauts hope, turn the ISS into the science platform for which it was advertised. A new accessory for the P4 solar arrays is the addition of the Solar Alpha Rotary Joint (SARJ). This mechanical joint is 10 feet wide, and is the largest mechanism ever designed to operate in space. The SARJ rotates the entire truss segment and allows the arrays to swivel so that the face of the solar panels is always turned toward the sun. Combining the SARJ with another moving joint called the Beta Gimbal Assembly allows the arrays to rotate on two axes. If it all works as planned, the arrays will be moving continuously as the station orbits the earth, obtaining the maximum amount of sunlight, thus providing the greatest amount of power. "The attitude of the station, of course is adjustable, but some attitudes are more favorable from a propulsion point of view and a control point of view than others," said STS-115 spacewalker Joe Tanner. "And so you really want the solar arrays pointing at the Sun perpendicular to the sun’s rays, so that you can get the maximum collection of energy." Because of the delays in getting this mission off the ground, STS-115’s crew has the distinction of boasting the longest training period of any previous crew, over 4 years. The Astronauts who will conduct the three spacewalks include three swimmers and a gymnast. Tanner, who swam competitively for the University of Illinois, will be making his fourth spaceflight, and is a veteran of 5 spacewalks. He is probably most famous for doing an on-orbit fix of the first set of the ISS’s solar arrays back in 2000. Panels of the array stuck together while it was being deployed causing one of the guiding cables to come loose, and Tanner returned the errant cable to the spool where it belonged. New procedures, such as warming the panels before deploy, are in place to try to avoid a similar problem on this mission. Teaming up with Tanner on EVA 1 and 3 is Heide Stefanyshyn-Piper (Stefanyshyn rhymes with definition). She learned to swim in the lakes of her home state of Minnesota, and before joining NASA worked as a diver for the Navy, conducting underwater repair and salvage operations on naval ships. This will be Stefanyshyn-Piper’s first spaceflight. EVA 2 pairs up Dan Burbank, a member of the Coast Guard who is on his second spaceflight, with Canadian Astronaut Steve MacLean, who also has been to space once before. MacLean was at one time a member of the Canadian National gymnastics team. All four spacewalkers will need the grace, dexterity and strength known to swimmers and gymnasts for their very ambitious and arduous planned EVAs. Translating across the growing station requires the spacewalkers to have three 85-ft long safety tethers. The Astronauts will have to bring numerous battery packs on each spacewalk for the cordless drill used in space, the Pistol Grip Tool, as they will be removing launch locks and restraints (there are two dozen launch locks on the SARJ alone), installing brace beams and struts, as well as removing some unneeded equipment and retrieving a science experiment. The Astronauts will use a spacewalking fanny-pack known as the Transfer Bag in which to store all the equipment that is removed or replaced. Pilot Chris Ferguson, who will assist with the operations of the station and shuttle robotic arms said that STS-115’s mission is important for the future of the ISS. "We’re setting the stage for what will be the continued development, the addition of the Japanese module and the European module," he said. "So, we’re laying the groundwork for what’s to come in the next couple of years."